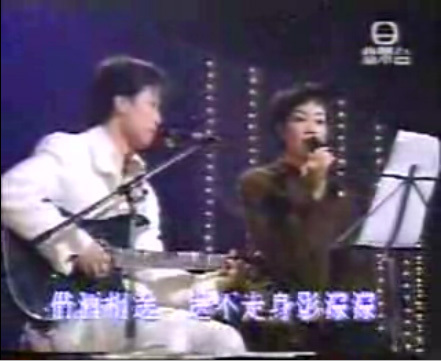 A rare duet by Faye Wong (王菲) and Samuel Tai (邰正宵 Tai Zhengxiao), singing “999 Roses” (九百九十九玫瑰). Not sure about the year — 1994, 1995? The audio was ripped from the video below. Faye’s voice is beautiful, crystal clear, and her harmony with Sam is breathtaking. Ooooh this has always been one of my favorite performances / songs of hers, from the moment I first saw it on a VHS a friend sent me. Simply beautiful! Great blog btw, I enjoy checking it out! Tks, Megan! I really like Faye’s duets. I think they demonstrate the kind of person she is – she tries to work with other performers (singers, musicians, arrangers, songwriters, composers) to create the best possible sound, and the results are remarkable. Even live performances with little or no rehearsals turn out fabulous. And in duets, we can sense her sweetness and kindness as an individual. She never tries to outdo or dominate. Her goal is always the most perfect harmony possible. I’m always surprised at how much better she makes her partner in a duet sound. It’s almost as though she brings out the best in them — in all performers she works with! Judging from the hair, I’d say this is around spring ’95 when she was promoting ‘Ingratiate Myself’ — it’s the same hairstyle as in the TVB version of the music video. She’s still really bright and happy here, though becane increasingly moody later that year (certainly by the time Di-Dar was released, with the reduced television appearances, refusing to attend award shows, and so on)… that’s always been my impression. Tkx, Cantopopulist, for the additional info and date confirmation. Fascinating re her moodiness. Any guess as to the cause? Re the date, I guess her hair was a little shorter in 1994 (CKE), too.